Ever looked at your bank account and found excessive overdraft fees? Ever used your debit card in a store that added an extra $1 to your total for using your card, or not allowed to use your debit card unless you spent a certain amount of money? How about the higher interest on your credit card if you use it for a cash advance? Ever been confused about the terms of your student loans? Think Sallie Mae is the devil now that you've graduated? Are you thinking of buying a home, but scared of the market? If any of the above relate to you, READ ON!! 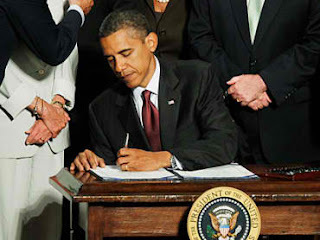 Today, July 21, 2010, President Obama signed the Wall Street Reform & Consumer Protection Act (Financial Reform), in Washington, D.C. This is noted as the first major change to the financial system in over 70 years. President Obama stated the purpose of the reform is that "these protections will be enforced by a new consumer watchdog with just one job: looking out for people- not big banks, not lenders, not investment houses- looking out for people as they interact with the financial system." Of course there are those who do not support the reform. They insist it won't change the economy and the big loan companies responsible for the assisting the recession are not held responsible. President Obama does confess there is still room for companies to act irresponsible: "For these new rules to be effective, regulators will have to be viligant". Meaning, passing the law alone won't change the world, and it will require change among our financial institutions. "In the end, our financial system only works- our market is only free- when there are clear rules and basic safeguards that. prevent abuse, that check excess, that ensure that it is more profitable to play by the rules than to game the system." I can't argue with that! COMMENTS!! How do you feel about the reform? Think it will help any?